Eric here providing the latest update on Still Waters II, crew and guest. 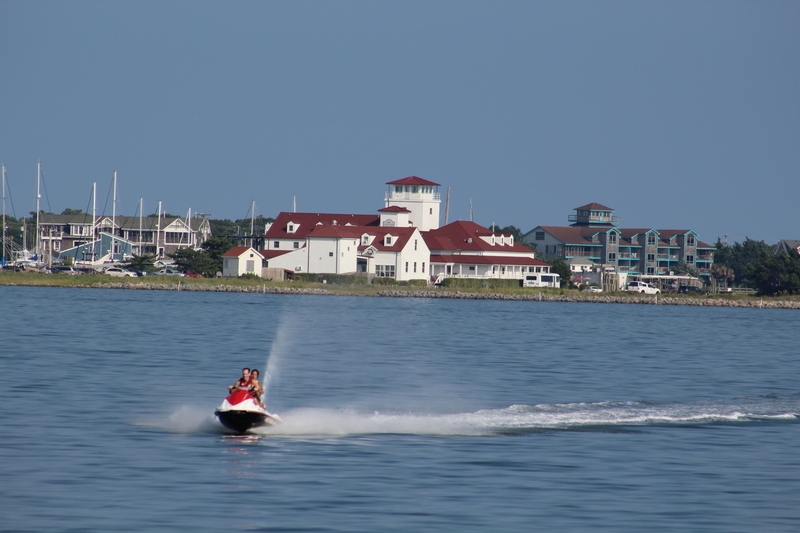 Since the last update, the crew traveled to mile 170 on the inner coastal waterway, then took off for a side trip to the outer banks of North Carolina. 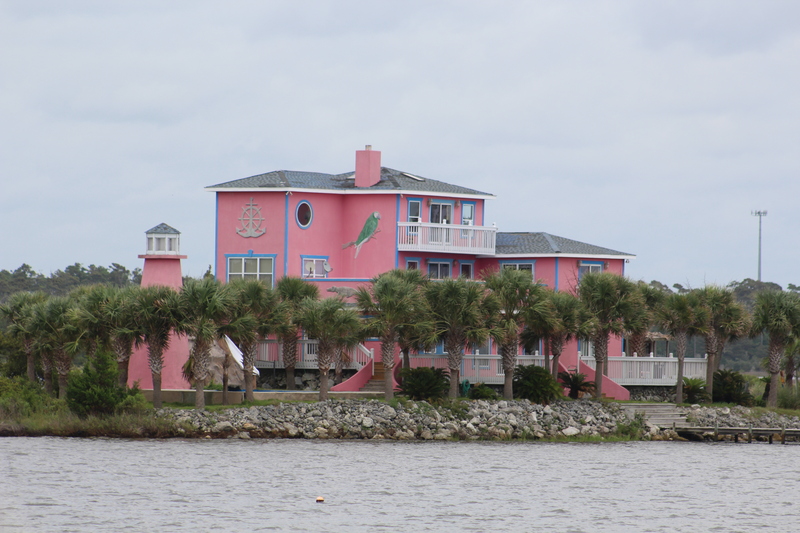 The run consisted of four days of travel with stops at Bald Head Island Marina, anchorage near Wrightsville, dock in Morehead at Port Side Marina, and finally the National Park Service dock at Ockracoke Island. As always, there are new challenges and things to learn along the way. These last few days have provided plenty of opportunity to learn for our crew. 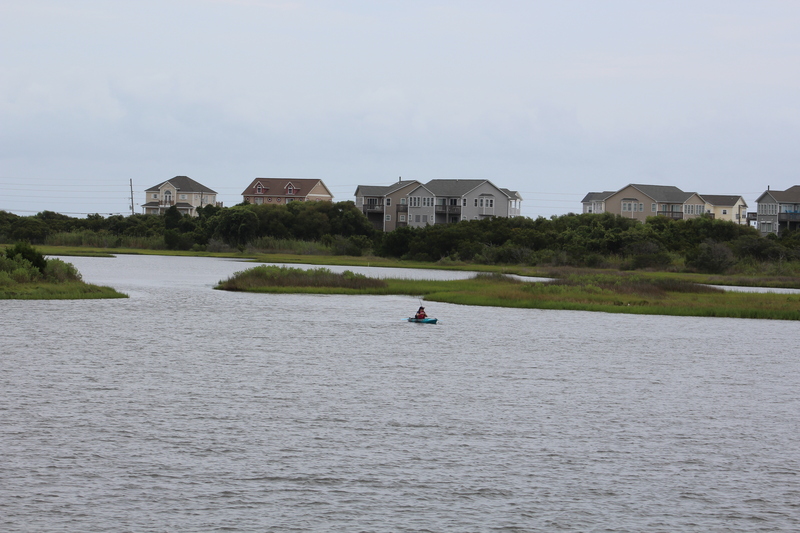 The crew left North Myrtle Beach on Sunday, August 9, at 0919. In less than 5 minutes they were at the Barefoot Landing Bridge and made their way on up the narrow rock pile. 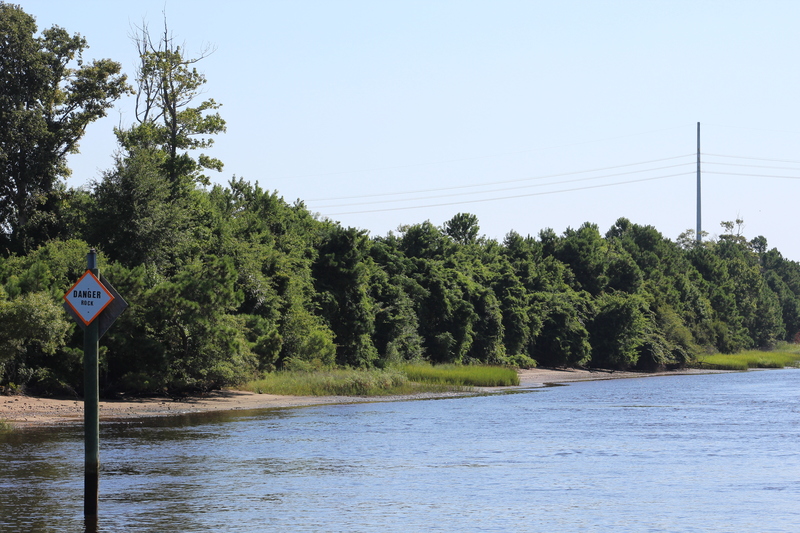 The crew entered into North Carolina at 1055 near the Little River Inlet. The skipper began to give the passenger, Jessica, a few lessons in navigating the waterway. She is a quick study, and by lunch she was behind the wheel guiding the boat northward. At the Lockwoods Folly Inlet, the water depth suddenly went from 10 feet to less than 4 as the boat glided over a shoal. The young skipper in training responded quickly and got the engines in idle and there was only a slight bump as they made way for deeper water. Jessica made a comment that the water sure changed depth quickly. These inlets are always a little tricky as they bring in sand from the ocean. Once again reinforcing the need for constant vigilance at the helm. 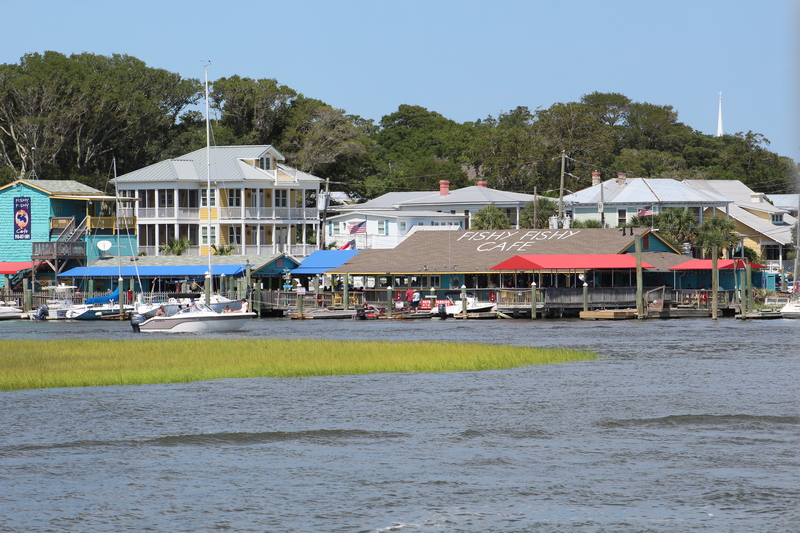 Rather than stay in Southport, the crew decided to venture off of the ICW and make the 2 mile side trip to Bald Head Island. The decision was rewarded with a nice evening of walking and exploring the sites, a surprise alligator in the marina, ice cream and fishing. The fishing was not as productive as hoped for, but lots of small fish were caught and two croaker were actually large enough to keep and fillet. 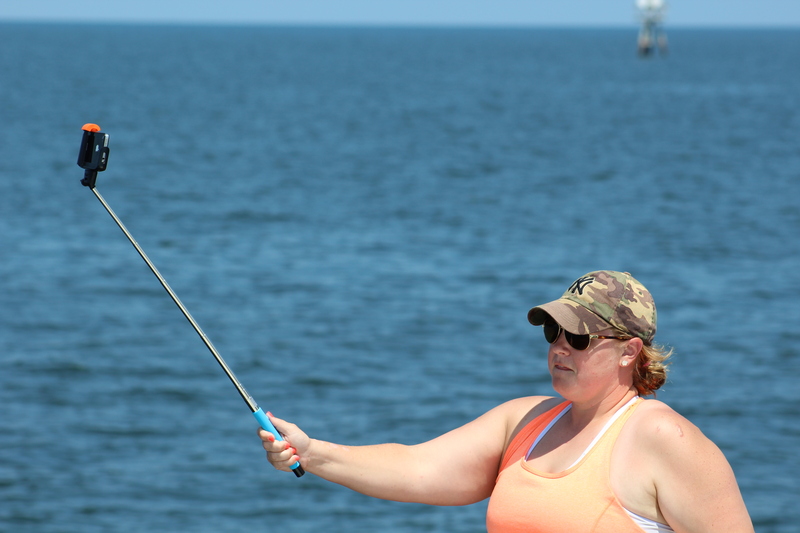 The mate broke out the tape measure and announced that Jessica’s croaker was larger than the skipper’s croaker. There is an official appeal submitted because the skipper did not witness the “official” measurement. 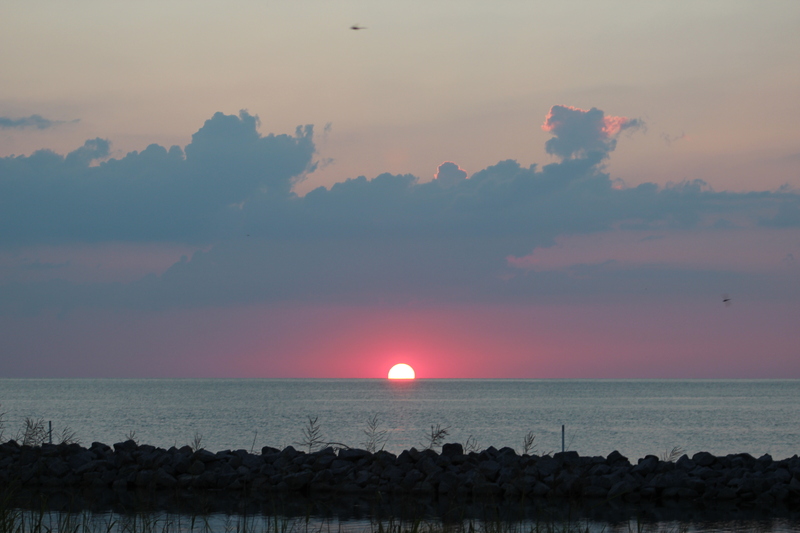 On Monday, August 10th, the crew left the dock at 0930 and headed north. The days challenge would be trying to meet the bridge schedule. There are two bridges in the path that must be opened, but these bridges open on a schedule. If you are not there on time you get to wait for the next opening. 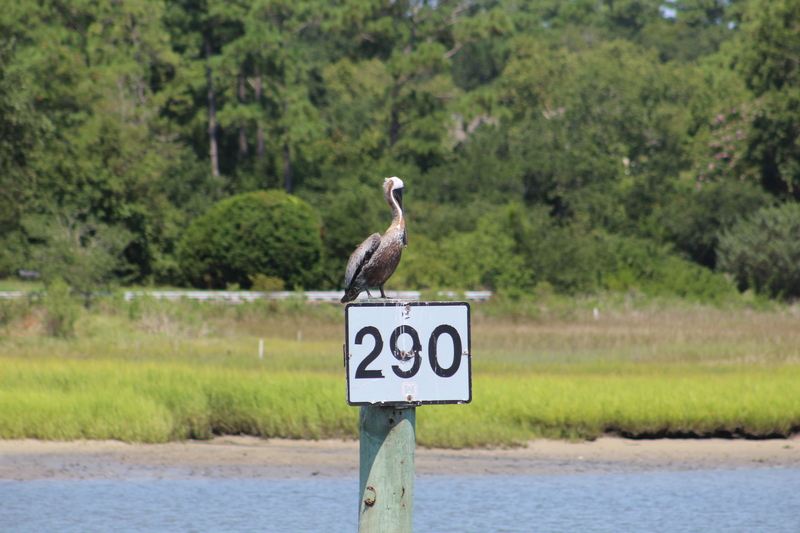 The skipper calculated the distance and speed needed to make the Wrightsville Beach Bridge for the 1300 opening. Unfortunately he missed the opening by about 5 minutes. They were at the end of the line to pass through the bridge and when they were about a hundred yards from the bridge, the bridge tender decided to close the bridge (time 1315). 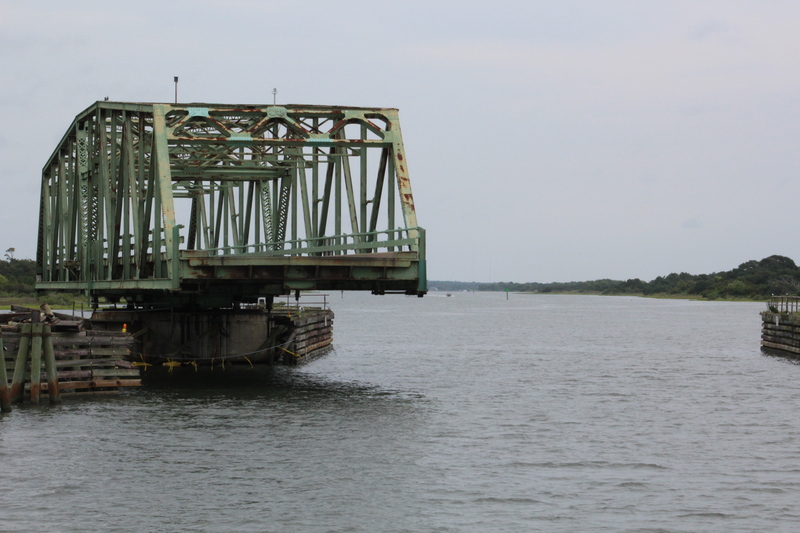 The mate and passenger both urged the skipper to gun it and make it through, but the skipper backed off and they toured Wrightsville by water while killing the hour for the next bridge opening. 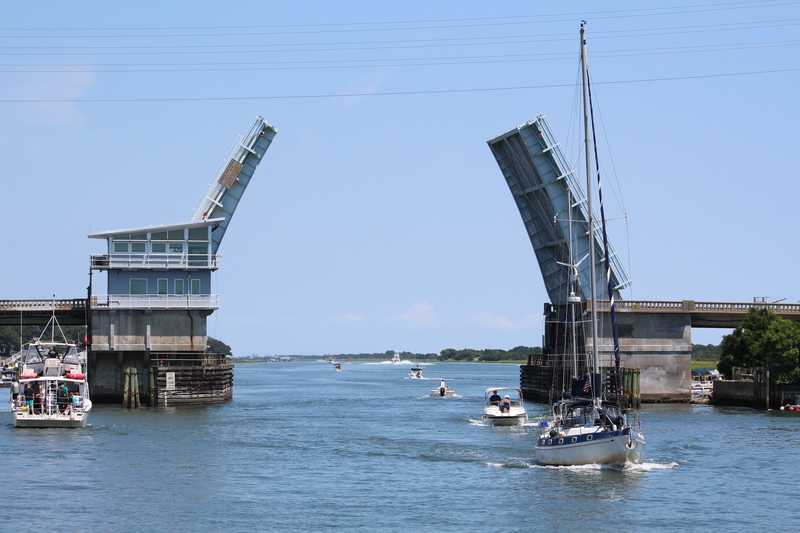 They were the second boat through for the 1400 bridge opening, but now needed to make the 8 miles to the Figure Eight Island Swing Bridge for its scheduled opening on the hour and half hour. 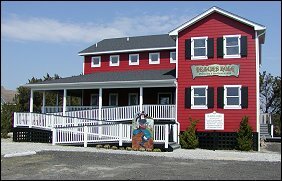 As they approached the Figure Eight Island Swing Bridge the mate looked at the time and announced that they only had 2 minutes before the opening, but based on their location, it looked like they would miss the 1430 opening. The skipper made a quick calculation and announced that they would make the distance in 2 minutes. This proclamation was met with doubt and a few off color comments. The skipper gave the engines more throttle and the engines responded. In moments she was up and planning at 16 knots. Jessica had a look of surprise at the speed after 2 days of 7 knots. Needless to say, they easily closed the distance and had to actually wait for the bridge to open. Jessica took the wheel again for the last two hours of the cruise and guided our crew to the eventual anchor spot at Top Sail Beach. The crew got the anchor to hold on the first try, and spent the rest of the evening fishing. It was an interesting time of fishing. The caught a couple of small black tip sharks, a puffer fish, many spot fish and croaker, and one sting ray. Unfortunately, nothing was large enough to fillet so it was all catch and release. On Tuesday, August 11th, the crew pulled anchor at 0925 and headed north. The days cruise was mostly in the narrow channel, interrupted occasionally by inlets to the Atlantic Ocean. 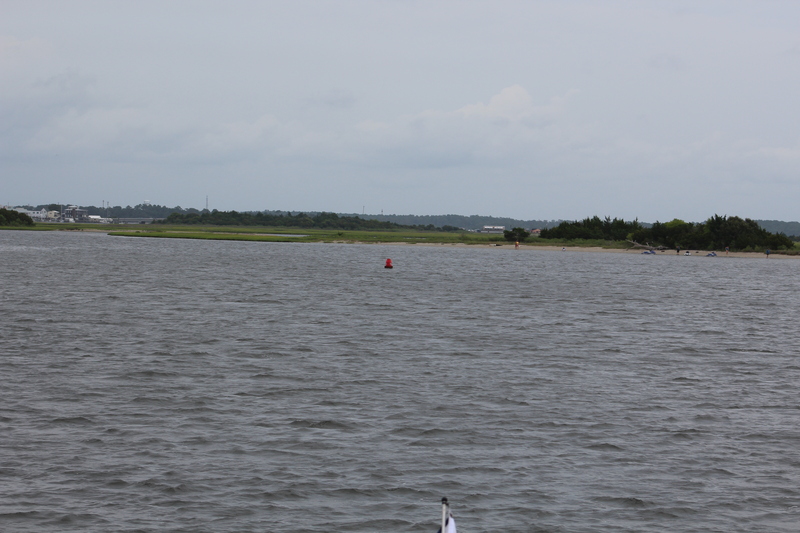 Inlets included the New River Inlet, Browns Inlet, Bear Inlet, and Bogue Inlet on the approach to Swansboro. The crew stopped at Casper Marina in Swansboro to fuel and decide their next move. The weather was building and storms were on the way. After fueling they made the decision to continue onward 30 miles so that they could be in a position to cross the Pamlico Sound if the weather was good on Wednesday. As they headed north, they seemed to stay just on the edge of the storm and keep in light rain. Jessica took the wheel again for a few hours and guided the crew through the Bogue Sound in the wind and choppy seas. 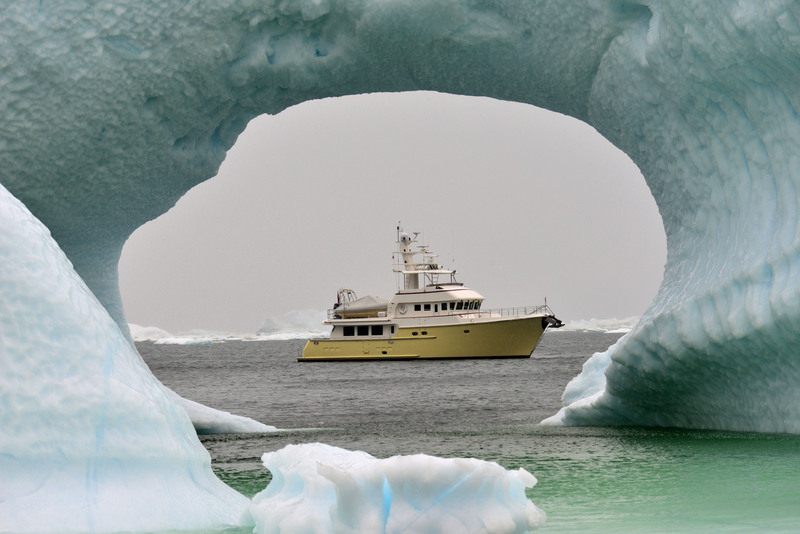 As they approached the marina, the skipper took the helm and the crew readied the boat for docking. The wind was building and the skipper requested a starboard side tie and easy docking. It seems the dock master and skipper have a different opinion of what an easy dockage looks like. The dock master directed them to back into a slip with the wind and current pushing the boat away from the dock. On the first try, the skipper backed alongside the dock and made the right turn into the slip, but the wind and current quickly moved them too far off of the dock to get lines to the dock hand. The skipper pulled forward, lined up again and started backing up and making the turn. They were closer to success but still unable to get the lines over to the dock hand. On the third try, the skipper maneuvered the boat within a foot of the dock and a 72 foot Nordhaven yacht before making the turn to the slip. Lines were tossed and the dock hand got the boat secured to the dock. As the crew completed docking the wind really began to howl and the waves were crashing over the dock. Good thing they got in when they did. They waited 2 hours for the storm to pass then walked down to the local tavern for more fish, shrimp, and chips. After dinner, they walked back to the boat and within minutes another storm blew in. The 72 foot Nordhaven was blocking most of the wind and wave action but it was still a rocky night on the water. While passing the time waiting to get to eat, Jessica googled up the 72 foot Nordhaven, Shear Madness, next to Still Waters II and found their blog, shearmadness72. Check it out to see how the truly wealthy handle the struggles of sea. The morning was spent trying to figure out the next move. It is getting time for Jessica to head back to Texas so an exit strategy needed to be determined. After numerous searches, a workable plan was developed and a cruising schedule to match was made. The crew left the dock at 0950 and headed for the Newport River, then Core Creek, and then Adams Creek. While passing through Adams Creek the crew met a south bound boat headed for Matagorda Bay. 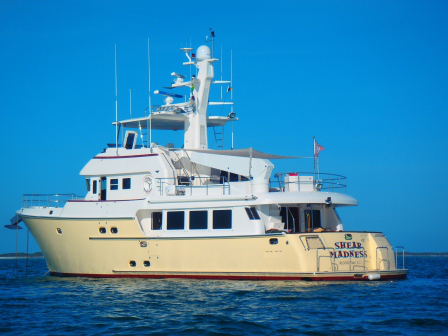 The boat was brand new, built in Rhode Island, and the captain was taking her to her new home in Texas. 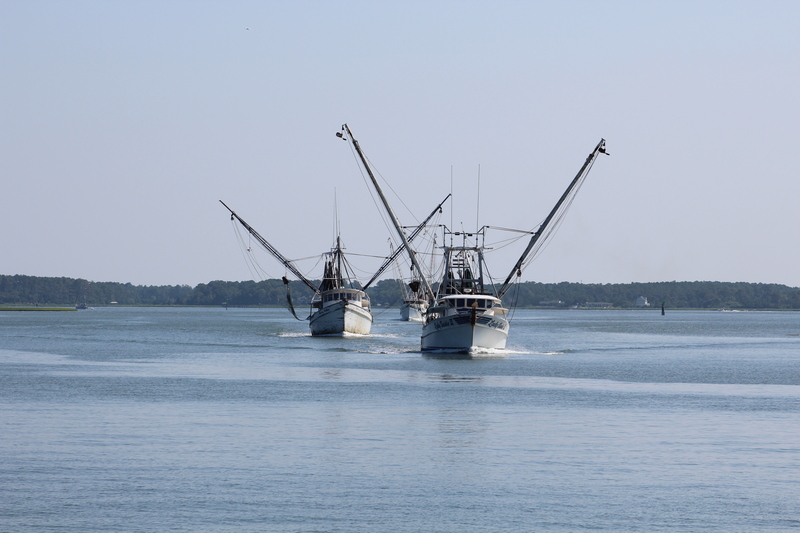 After passing Oriental the crew headed out into the Pamlico Sound. The waterway guide states that Oriental is not the end of the world, but you can see it from there. As you look out from this point you see the earth fall away out across the sound. As the crew ventured further out into the Sound, there was a time that land was barely visible in only one direction. Eventually land was spotted and the crew found the inlet to the marina. Upon entering into Silver Lake, they motored to the National Park Service dock, but it looked full. This area is first come first serve. There was one hole left open but the skipper did not think it was long enough for them to fit into. They motored around the small lake and found all the marinas full. They headed back over to the Park Service to re-survey the one spot that was available. They crept up to the spot and pushed the bow up to the corner of the pier. You know it will be an interesting docking when you draw a crowd on your approach. Jessica jumped off the boat and secured the bow. The skipper then used port reverse on the port main engine to swing the stern up along the dock. They had a whole three feet of clearance to the boat just aft of them once they got squeezed into the dock. The crowd dispersed disappointed with no damage, but amazed that they shoe horned her into the dock. Thursday was spent exploring the island. They first went and visited a British cemetery. Four British sailors who washed ashore after the sinking of the HMS Bedfordshire are buried in the cemetery. British tradition dictates that the sailors be buried on British soil. 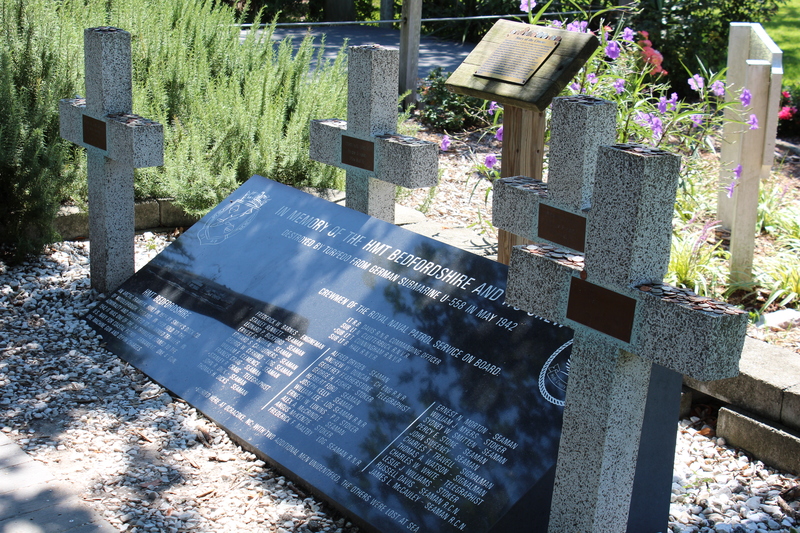 The small graveyard is leased by Great Britain, and cared for by the US Coast Guard. The British flag fly’s overhead and the ground is technically British soil. 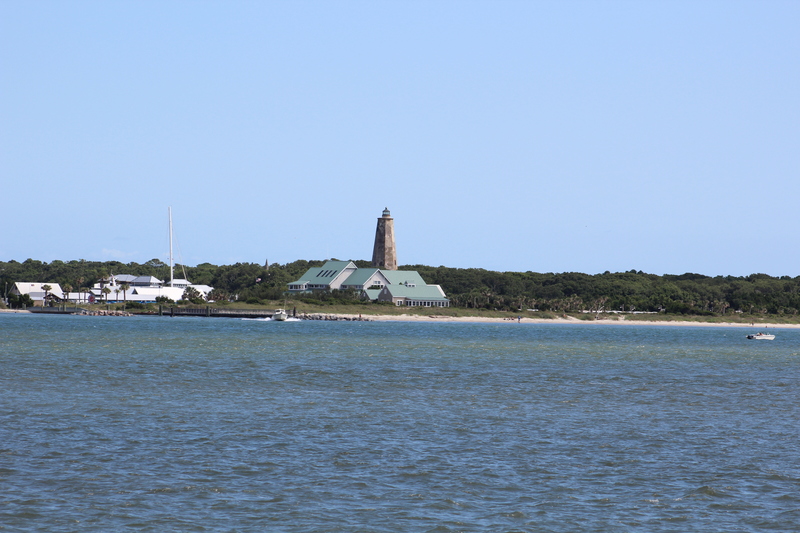 Next up was the Ocracoke Lighthouse. The crew pedaled over to the lighthouse which was built in 1818. They then pedaled out to the 15 miles of unspoiled beaches. The water was a pretty green turquoise and the beach was a brownish sand. Last stop was the Teach’s Hole Blackbeard Museum. Edward Teach, alias Blackbeard the Pirate spent most of his time in these waters. After 2 years of serious pirating, the authorities finally killed him off of Springer Point. Friday morning, Jessica got up at 0600 and prepared to depart. She left Still Waters II at 0645 and walked over to the ferry. She took the 3 hour ferry ride back to the mainland, and then caught a shuttle service to Greenville. On Saturday, she will fly back to San Antonio and get ready for another year of coaching at the University of Texas San Antonio. In her short time onboard she mastered piloting the boat, knot tying, and all around deck hand duties. The mate will certainly miss her help during docking and undocking. As for our crew that took a very rough 3 hour ride over to Hatteras Island and docked at the Village Marina. The wind was strong out of the north and whipped up 3-5 foot waves, with occasional 7-8 footers. The crew was glad to get back into port and relax after the rolling water roller coaster ride. But, Just another day in paradise!